The President of Arab American University Prof. Ali Zidan Abu Zuhri welcomed the delegation from the Police Directorate of Jenin to discuss ways of cooperation to provide security and safety for students outside the campus and organizing traffic. 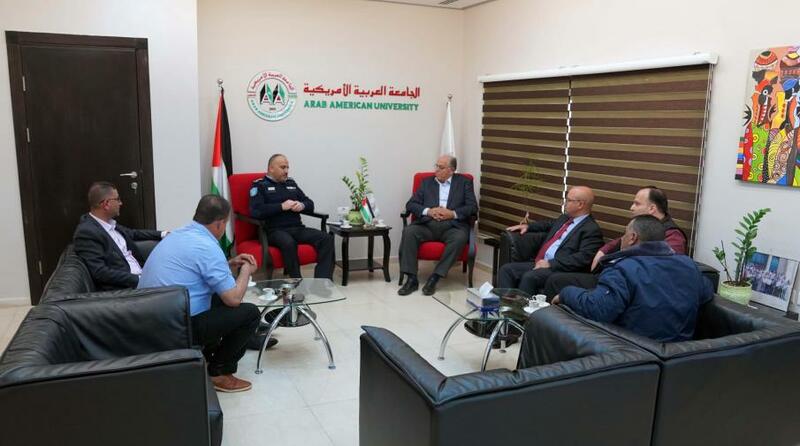 The delegation included the director of the Police Directorate Col. Nadi Halahleh, Head of Academic Affairs Dept at the Police station Col. Mansur Khuzaimia, Head of Traffic Dept at the Police Station in Jenin Col. Majdi Darwish. Whereas the VP for Administrative and Financial Affairs Mr. Faleh Abu Arrah, PR Manager Mr. Fathi Amour, and Head of the Security Dept. at the University Mr. Fakhri Jaradat also welcomed the delegation. The two parties discussed the methods of organizing traffic at the university and providing security and safety for students outside the university campus and near the housing units, especially with the increase of population in these areas. The two sides also discussed the establishing a police station near the university, in addition to other things that aim to ease and comfort the life of the students whether on campus or outside.